Santa Giulia is a ketch boat made of solid oak. It was built in 1973 by SERTRAL shipyard in Sète. The hull was drawn by André Mauric. André Mauric is a famous architect of the 1970s. 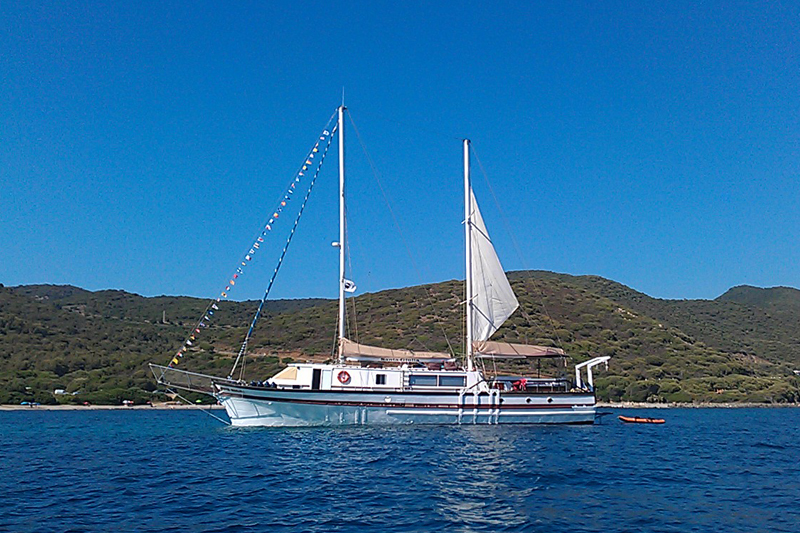 Santa Giulia distinguishes herself by her robustness and comfortable navigation. With her wide decks and large sunroof, you will enjoy your cruise in complete safety and with maximum comfort. Santa Giulia’s speed is between 6 to 10 knots depending on if we use the sails or the engine. You will have the pleasure of a unique way to discover Corsica. Thanks to Santa Giulia’s anchorage capabilities and a crew expert in finding sea shelters, you will have the privilege to visit amazing creeks and beaches only accessible by the sea. The pleasures of yachting are available to you: snorkeling, visiting the caves in speedboat, sea kayaking, marine fishing or simply sunbathing and relaxing while reading a book surrounded by 360 degree Ocean view. Inside Santa Giulia, you can relax below deck with big plate glass windows, through which you can admire the lovely scenery in which Santa Giulia is anchored. The brightness and the spaciousness makes a friendly space for conversation and games. A vast sofa ensures the comfort during meals. For your stay, Santa Giulia provides five comfortable cabins, with double bed or bunk beds plus cabinets for storing your things. 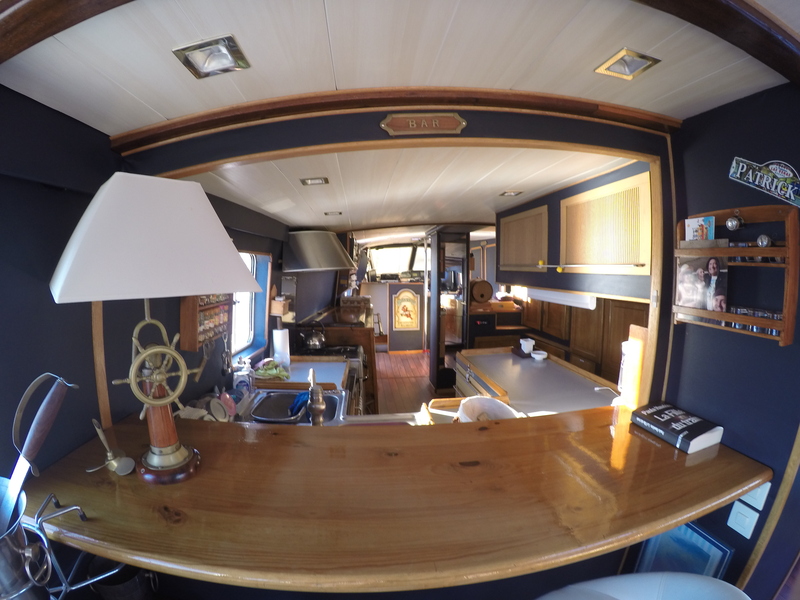 The aft cabins offer a spacious cabin with a double bed, two wardrobes, chest of drawers and dressing table, and a private bathroom with a toilet, a shower and a double sink, all for enhanced comfort. Santa Giulia has comfortable and bright bathrooms, you’ll want for nothing during your stay on board. What would be a cruise in the Mediterranean Sea without the sun? Aboard Santa Giulia, you will always be able to take full advantage of it. 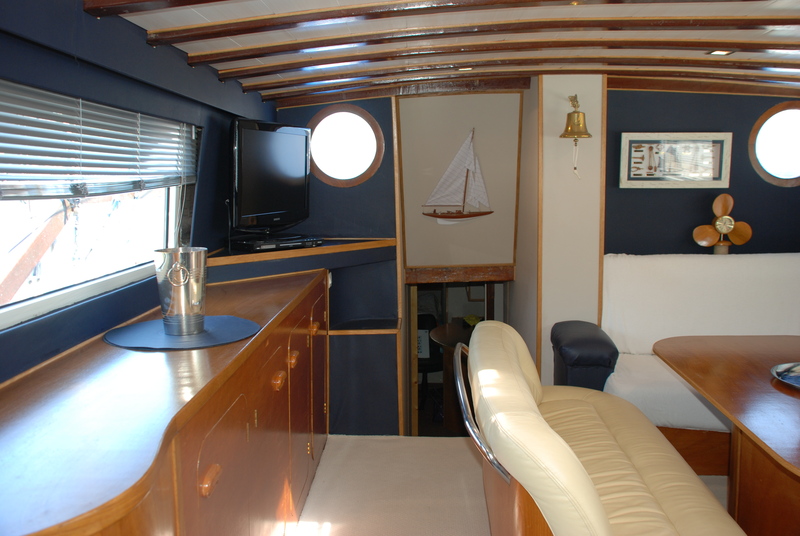 The large rear deck of 35m ² is equipped with L-shaped two sofas and a central table where up to twelve people can have a drink, take their meals and savor their cruise. A large awning covering deck protects guests from the sun.